Just a brief update on the Mission Rose project. The stem is finished, and the bud is underway and will be finished this weekend. Then, I’ll be experimenting with some fabric for some appliqué work on the piece. Can’t wait to get to that point! Here’s the project so far. The photo above was taken in direct sunlight at a slight angle. Taking pictures in sunlight can be a good thing or a bad thing – some aspects look quite good in sunlight. But because the shadows are more severe, other aspects might not look quite as favorable. I like to take photos in direct sun now and then, because it shows me things I wouldn’t necessarily see, sitting under a light. One thing I expected when I took the photo outside in the sun was that the pink ground fabric would show up as the slightly blush-pink color that it is. It didn’t. It looks somewhat putty colored on my end. It’s a much lighter, delicate pink. And now, on to the bud! What do you think? Ermine fur for the collar? I’ve decided to name the bud Eva Gabor. When it starts speaking to me and calling me “Daaaahling,” I’ll let you know! Advance Warning: I’m not changing the bud. I did experiment with some overlays to see if I could fudge around a bit and work something else out, but in the end, I decided to stick with it as it is. 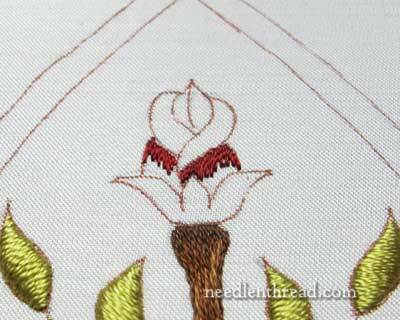 If you don’t like the bud but are planning to work the project, I’d suggest fiddling with it on the Mission Rose embroidery pattern until it’s just as you’d like it, and then re-tracing the pattern with your adjustments, and then transferring the design. If you’d like to read the backstory and follow along with the development of the Mission Rose project, you’ll find all the articles in this series listed in chronological order in the Mission Rose Project Index. I haven’t got to look in for a little while and when I saw the photo of where you were up to tonight I involuntary drew in my breath. It’s so beautiful. I like the but, it’s lovely. Cheers, Kath. Whoops…I meant I like the bud! Oh la la! It’s looking amazing I love it and you are so right about sunlight I’ve taken photos and some are great and some are not. I love the stem it looks really good with the brown. I can’t wait to see what you do next. Have a great weekend. It looks amazing…ermine fur??? is it a stitch?? She’s done many articles about stumpwork. You can either do a search and type in “stumpwork” in the box up to the left or try this link. I’m not very computer savvy but I did a search and came up with her page listing all the blogs she’s written about this subject. I hope it works and I hope it helps. I love the rose and the stem and even the bud – what I am unsure about are those ?leaves? or Dr Seuss mitts out to side. I can’t wait to see what you do to them. If I were to work this design, I am not even sure what I would do about them, so please Mary, hurry and put me out of my misery. The are mission rose is beautiful. The leaves look like they are shining, and I love everything about it: the colours, the stitching, etc. I am so glad you left the bud the way it was. It will look fabulous as all your work does. thank you for not changing it! Thank you so much for taking us along on your Mission Rose journey of discovery. We’re all learning as you stitch. Just popped over to Ask and Share and congratulations on the Third Anniversary this month of this great resource. Thank you too for inspiring, reinvigorating and helping so many of us around the world with such dedication, thoroughness and generosity of time. This is so beautiful. Color choices and shading are perfection! Very inspiring and motivating. gracias,su proyecto es muy hermoso,yo sigo todos los proyectos con mucho interes. Previous Previous post: DMC Diamant – A Give-Away!